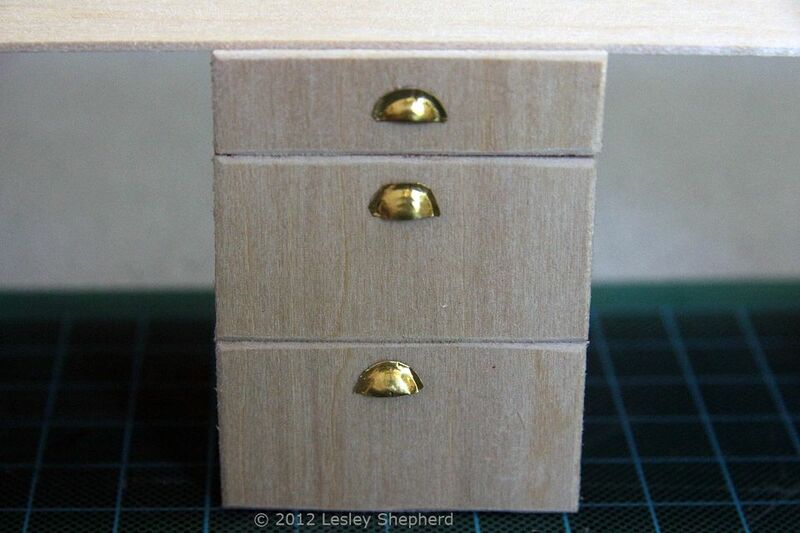 Bin pull handles are a period style addition to a range of dollhouse miniature projects. With a bit of preparation you can make a mold and emboss your own dollhouse scale bin pulls from thin metal sheet or tape, or foil paper. The technique isn't difficult, and the handles can be made in a variety of scales. The ones shown here are in 1:12 scale, and were made from 1/4 inch thick brass tape sold for scrapbooking. Copper and other metal tapes are available for stained glass work and other purposes. These bin pulls work well on the traditional kitchen base cabinets or the dollhouse night table. They can be fixed in place with glue or small screws or nails, depending on the scale of pull you require. You can make the pulls in scales as small as 1:48 with care. To make the bin pull handles you emboss strips of lightweight metal in a solid mold. You can make a suitable mold from many materials, I used scrap polymer clay as it is a material many miniaturists have on hand. Dental plaster will also work. To make the polymer clay bin pull mold you will need a flat circular object that equals roughly 5 inches in your scale, and a round ended object which is roughly equal to 3 inches in your scale. I used the lid of a tube of mechanical pencil erasers for my flat object, and the end of a wooden embossing tool for my rounded object. Press the flat circular shape against a square of polymer clay at least 1/4 inch thick. You need to indent the clay by less than 1:32 of an inch (less than 1mm). Press the round ended object just in from the edge of your flat impression to set the shape of the bin pull into the mold. Most bin pulls are roughly 1 inch to 1 1/2 inches deep, so press your round object between 1/32 and 1/16 inches (1mm and 2mm) further into the polymer clay than you did your flat object. The deeper you insert your round ended object, the more round your pull will be shaped away from its backing. When you have your embossing mold shaped the way you want it, trim the mold across the center to set the lower edge of the pull. (see photo). Cure your clay in an oven according to directions. If you have made your mold from a cast of dental plaster, trim the mold when it is still damp, and set aside to dry fully. To make the miniature bin pulls, you can use metal strips cut from thin sheet metal (the type used for scrapbooking), strips cut from foil pie plates, or strips cut from rolls of decorative metal tape. (the tape is available from the photo and scrapbook sections of many craft stores). To emboss the metal strip in your bin pull mold, lay the strip so the even bottom edge of the strip is centered in your mold and begin embossing the strip to the mold from the center of the deepest part of the mold, out to the outer edges. Use a round ended embossing tool or a round ended toothpick to smooth the metal into the shape. Work carefully and evenly around your mold. In the photo, I am using a sticky backed brass tape, and have left the backing in place to make it easier to emboss. If possible use metal with no backing, the embossing process will be easier to gauge. When you have your strip of metal embossed to shape, remove it carefully from your mold (tweezers help) and trim it with scissors so the flat edge around the pull is less than 1/16 inch wide. (see photo). When the pulls are finished you will glue them to your project or attach them using brads along the flat section above the pull, so make sure you have enough space above the pull after trimming to allow you to fasten it to a drawer front or door. To finish the back of the dollhouse bin pull, flip it over on your work surface, or set it back into the mold and fill the pull section with white glue, gesso, or plaster. Filling the back of the pull with a soft material that does not shrink a lot will help to support the shape of the pull, which otherwise could be easily dented. It make take several applications of glue or gesso to fill the back enough for support. You don't need to completely fill it above the pull line, or it may show when the handle is fixed to your door. If you wish, use a pin or a fine embossing tool to mark miniature circles and lines for screw heads at either end of the supporting plate and in the center of the supporting plate for the handle (the part above the pull). When you glue it to your project, these embossed lines will resemble tiny screws used to fix it in place. If you prefer, you can drill small holes in the support plate and use brass brads (dollhouse nails) or small brass screws to fix the handles to your project.